Oh K! Cucumber Sheet Mask-Oh K! 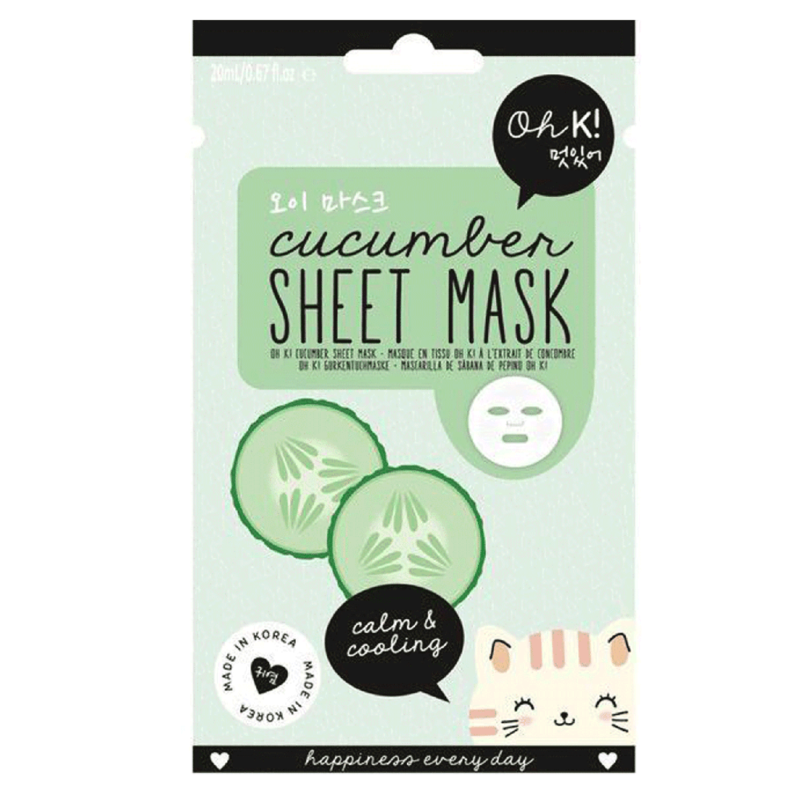 Harnessing the cooling properties of fresh cucumber, this sheet mask has calming properties to soothe unsettled skin. This ultra hydrating sheet mask is made from an exquisite combination of botanical ingredients including cucumber juice extract, honeysuckle, aloe and green tea to calm and soothe stressed-out skin. 3. Put on one of our playlists and relax for 10-20 minutes. 4. Remove mask and use circular motions to massage residual liquid into skin. 5. No need to rinse. Aqua (Water, Eau), Glycerin, Dipropylene Glycol, Alcohol, Betaine, Cucumis Sativus (Cucumber) Juice, Butylene Glycol, Paeonia Suffruticosa Root Extract, Centella Asiatica Extract, 1,2-Hexanediol, Chamomilla Recutita (Matricaria) Flower Extract, Glyceryl Caprylate, Ethylhexylglycerin, Sodium Hyaluronate, Phenoxyethanol, PEG-60 Hydrogenated Castor Oil, Sophora Angustifolia Root Extract, Lonicera Japonica (Honeysuckle) Flower Extract, Camellia Sinensis Leaf Extract, Prunus Persica (Peach) Leaf Extract, Ginkgo Biloba Leaf Extract, Scutellaria Baicalensis Root Extract, Xanthan Gum, Carbomer, Potassium Hydroxide, Disodium EDTA, Aloe Barbadensis Leaf Extract, Parfum (Fragrance).